Just like with many community service projects, this one began with a phone call. Larry Collette, a retired pipefitter, called the business office at Sheet Metal Workers Local 80 in Detroit to request assistance with a project at Special Dreams Farm, a nonprofit working farm he and his wife began in 2004 to teach adults with developmental disabilities work and life skills. 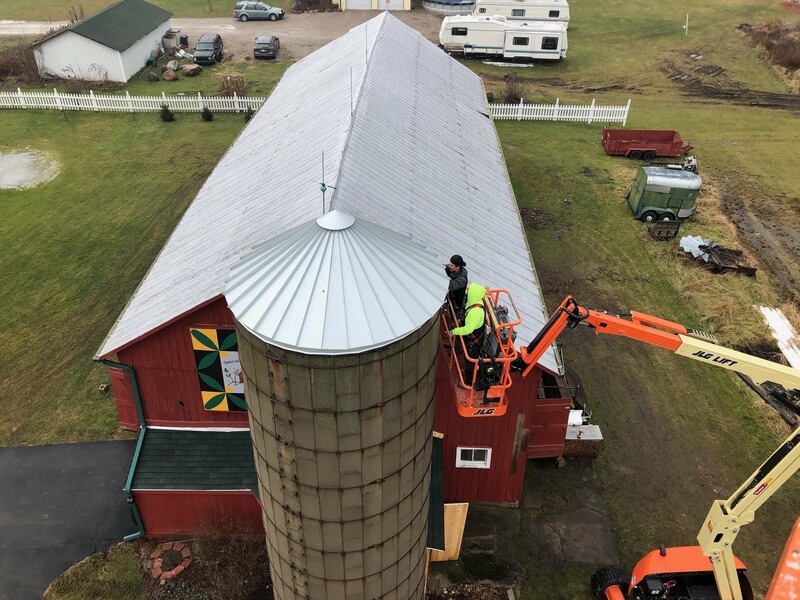 On the farm in Michigan’s St. Clair Township, there was a silo where Collette had planned to house two goats. The problem — it needed a roof. Local 80 Business Agent Jason Grunenwald and Organizer Alex Brzuszek placed a call to its training center and full-time instructor Sam Velez, who jumped at the chance to teach apprentices a skill outside the training center. Velez sketched the design for nine first-year apprentices and put them to work using materials donated by Alliance Mechanical and Cass Sheet Metal. At Local 80, 60 percent of an apprentice’s schooling takes place the first year, so Velez saw this as a golden opportunity to stand back and watch them learn to work, follow plans and construct the roofs together. “Being that I mostly work inside, it’s nice to see the architectural application outside,” said Justin Qualenbush, an apprentice who worked on the project. The first-year apprentices also got a glimpse of their careers to come and how their skills can further help people in their community. Cass Sheet Metal also donated a fifth-year apprentice’s time to mentor the group, and DTE Energy donated the use of the crane. “We get a lot of opportunities to practice skills we learn in school, but when we can come out and benefit the community in a positive way, I think that’s really important and beneficial,” said Benjamin Engelhardt, apprentice. The Collette family created Special Dreams Farm because they were disappointed with the post-secondary education available for their autistic son. The program gives meaningful work — from learning to build a fence to following recipes in the kitchen — to those who are often forgotten once they leave the public school system. Those interested in Special Dreams Farm can visit the website at specialdreamsfarm.org. More than 14,000 apprentices are registered at over 150 training facilities across the United States and Canada. The International Training Institute is jointly sponsored by SMART, the International Association of Sheet Metal Air, Rail and Transportation Workers (formerly the Sheet Metal Workers’ International Association) and the Sheet Metal and Air Conditioning Contractors’ National Association (SMACNA). For more information about ITI and its available training curriculum for members covering sheet metal trade work, visit their website or call 703-739-7200.